Reigate and the UK has a cold spell arriving imminently, but nothing as dramatic as the US NE snow storm Juno. 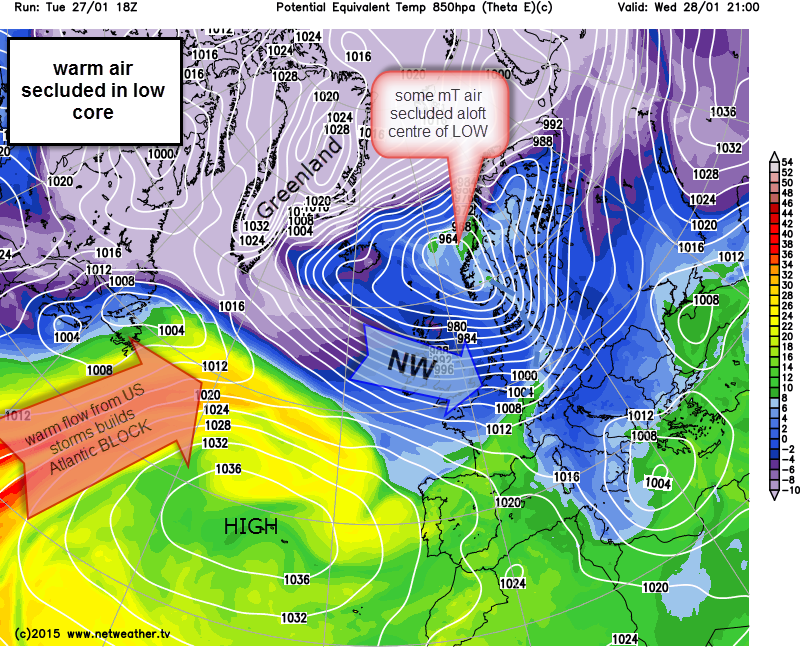 Our cold spell has little to do with the US storm except that Juno is doing a good job of pumping SW warm air on its backside into building the mid-Atlantic high pressure ridge that will encourage Arctic air to plunge south over the UK this weekend, in conjunction with a LOW over Scandinavia. So storm Juno is not arriving in the UK, and never will, but it has indirectly impacted our weather along with other storms in the US NE seaboard. Theta E charts are good for looking at airmasses, the different air masses stand out clearly as different colours below. 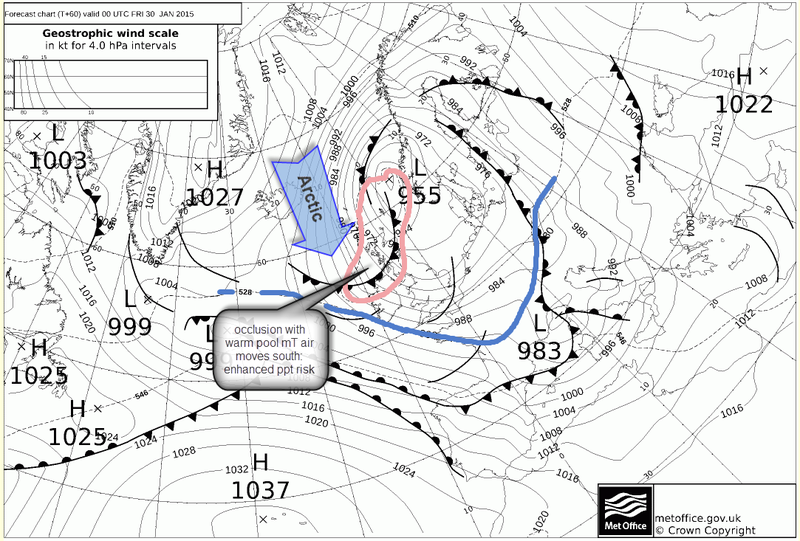 The metoffice fax charts are for comparison. 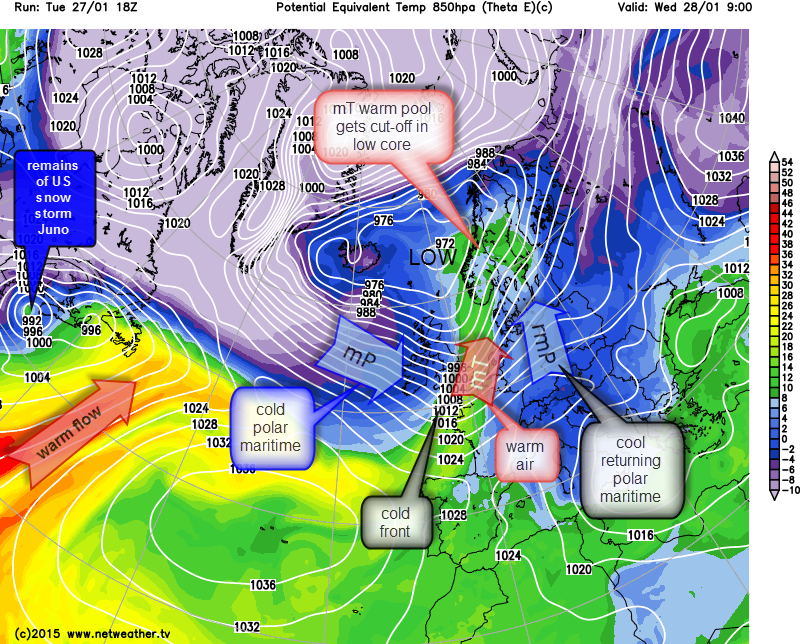 The active cold front sweeps across the UK tomorrow Wednesday bringing rain to the SE but more importantly ushering in a blustery NW polar maritime wind carrying air from a source region over the Greenland ice cap which will push temperatures from near double figures in the morning in Reigate to freezing overnight with wind chill making it feel more like it should at this time of year. Reigate is unlikely to see snow during the cold front passage as the coldest air takes a while to arrive behind the frontal rain. This cold front is interesting because it roars in so fast across the Atlantic, swinging around a low pressure between Iceland and Norway, that parts of the warm and more humid sub-tropical maritime air ahead of it is effectively chased up into the low core where it is secluded and trapped / sequestered by the advancing polar air. 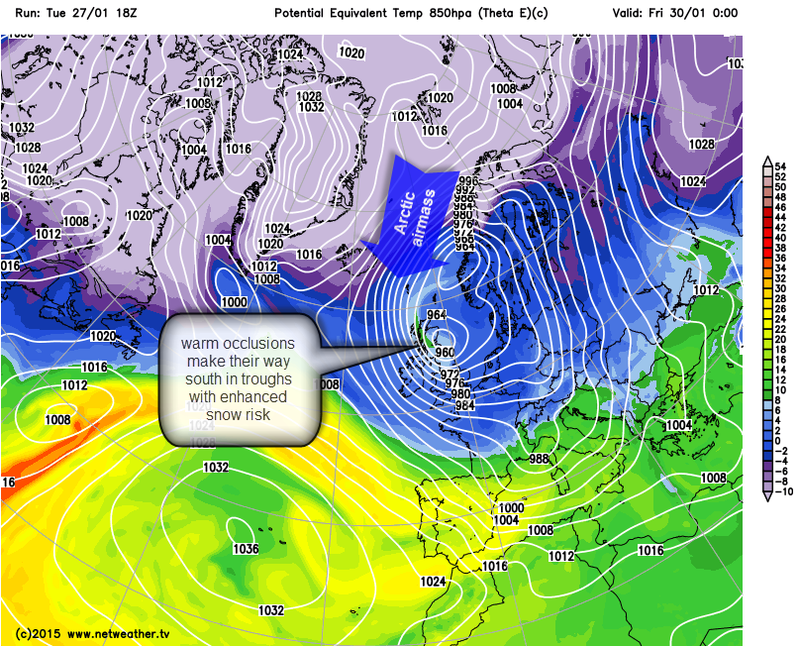 This has implications for later when warm pools of air form occlusions that could enhance snow risk as they are dragged south by the advancing Arctic airmass through to the weekend. The polar air from Greenland is a comparatively dry airmass but extremely cold aloft and becomes unstable as it passes over a comparatively warm Atlantic. 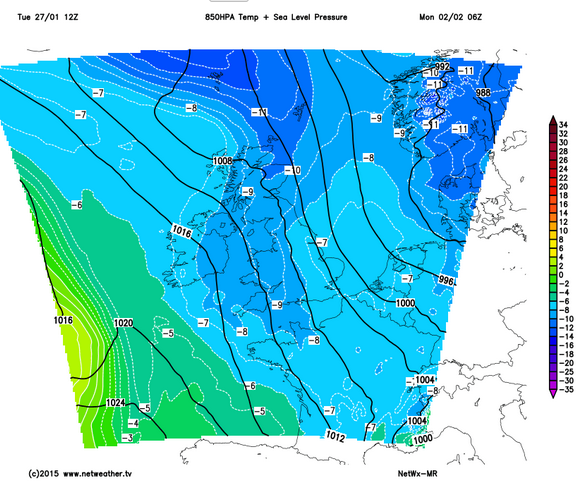 This combination is likely to bring considerable snow to high ground over the N/NW after the initial front has passed. Usually snow showers in the NW would be it with polar maritime air but this wind will be strong enough to push showers across more of the country and even reach us in the SE during Thursday. Expect many of these showers to be wintry in air that is below -5C at 850hPa (1500m). Often snow showers form streamers / lines of showers that could accumulate reasonable snow cover for some places whilst others see nothing. 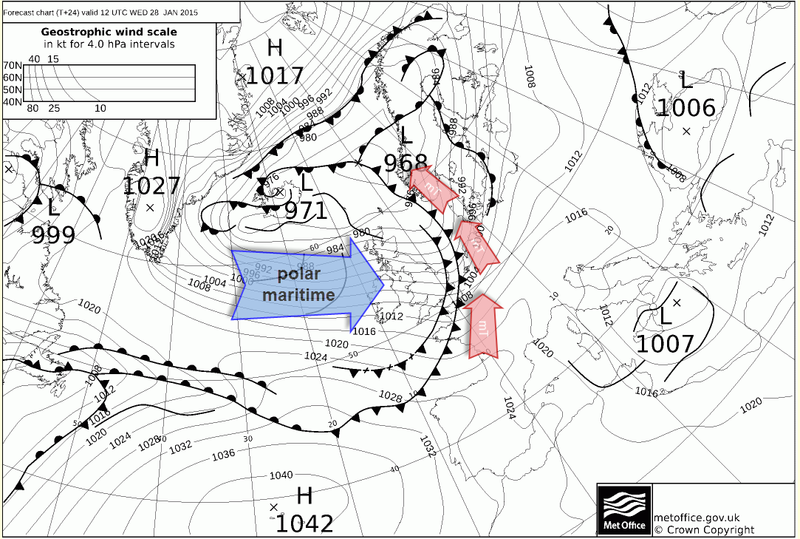 The secluded warm air trapped aloft will form occluded fronts that are due to move south later Thursday and into Friday as the isobars squeeze together between the building Atlantic ridge and the Scandinavian low pressure. This will actually raise the temperature a tad for a while on Friday before the colder Arctic airmass arrives, direct from the north, into the weekend. The warm secluded air will oddly make the advance of Arctic air initially warmer than the polar maritime, thus temperatures on Thursday are likely to be colder than those on Friday. The coldest Arctic air is due to arrive through Sunday into Monday when some truly chilly air will make it down through the UK.